Welp. That didn't take long. 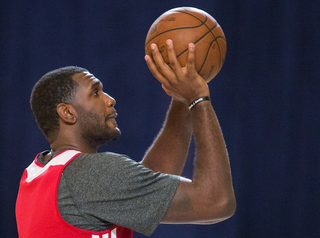 Greg Oden only took part in his first five-on-five drill with the Heat on Monday, but he had to be held out of practice today because of swelling in his left knee. ESPN's Brian Windhorst calls it a "slight setback," but it still can't be good news for a guy whose knee troubles have kept him from playing in the NBA since the 2009-10 season. Here&apos;s a telling bit from a TrueHoop piece on Greg Oden over the weekend. "Next thing to do is get (the swelling) back down and get out there and figure out what I can do to not let it swell again." The Heat, rather carefully, have set no timetable for Oden's return.